Koyo incorporates application specific mounting locations for all fan shrouds, inlet/outlet hoses and top/bottom mounting pins, ensuring quick and pain-free installs. 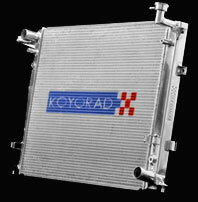 Each Koyo All Aluminum Race Radiator is Heliarc welded individually by hand. This creates the strongest aluminum to aluminum bond, to mate all components.